Achilles problems are common amongst runners and ramblers and it’s something we have seen a lot at Shepherds’ Physiotherapy. There has been a great deal of research into the management of tendons in the last few years which has changed the way Physiotherapists are approaching the condition. Before generalising Achilles management it is important to know that different portions of the tendon can be affected; most commonly we see a mid-tendon pathology and this is what I will refer to in this blog. Insertional tendon pathologies need other strategies so it is always important to gain a professional opinion. Tendons become an issue when they are overloaded, i.e. when increasing your running mileage or speed. However we know if you rest the tendon altogether to allow it to ‘heal’ it results in a poor quality tendon making it more prone to re-injury. Research suggests applying a correct load to the tendon will promote a better quality repair. Rehabilitation of the tendon needs to be specific to the tasks you are asking it to do, for example rehabilitation for a rambler would differ to that of a tennis player due to the different forces and directions applied to the tendon during the activity. 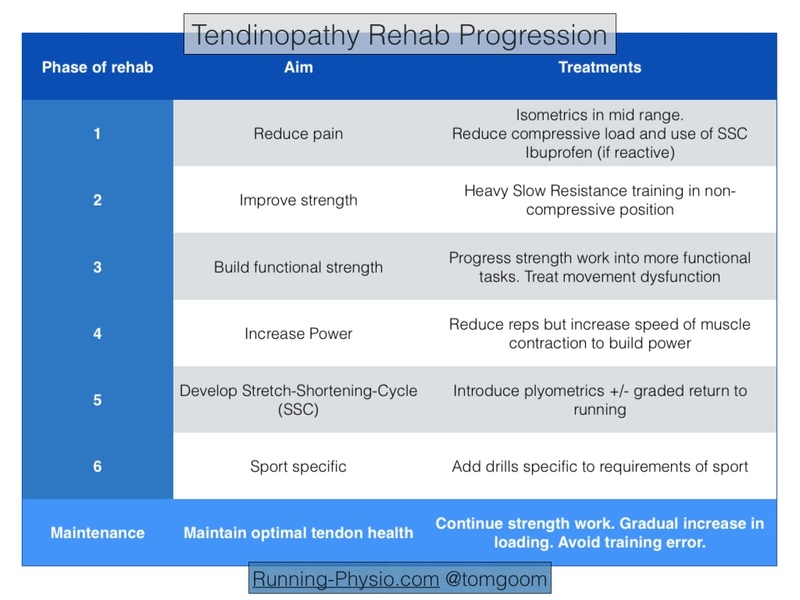 Follow this link to Tom Goom’s article to see how we would progress from early to late stages of rehab http://www.running-physio.com/wp-content/uploads/2013/06/wpid-Photo-9-Jun-2013-1533.jpg. Early management of an acute Achilles tendinopathy includes reducing the activity which is overloading the tendon, ice, elevation and anti-inflammatories. As mentioned it is still important to exercise the tendon, for really acute tendons you may have to perform a static calf raise initially, however the sooner you can progress to a slow muscle contraction the better. You should be guided by how your pain responds to the exercise, if it is sore for no more than 20 minutes then you have found a good level, if your pain hangs around for a day or two you have done too much. Exercise programmes are very dependent on the individual and should always be administered and assessed by a professional. Here at Shepherds’ Physiotherapy we offer a graded rehabilitation programme in conjunction with manual therapy to aid with good quality tissue healing and pain relief to get you back to your activity of choice sooner. To kick start your recovery contact us via our enquiries page or call us today on 01371 700466.